I use the MLB At Bat app on a few different Android devices. The audio has been a problem for a very long time. Not the quality of the audio, just getting it to play at all. Until today, I had never spent the time and effort to deal with it. 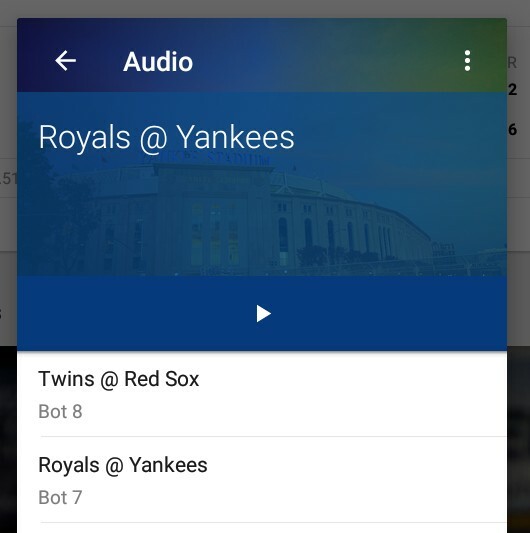 When the audio feature is working, you first select a game from a list of those currently being played, and then the app shows you the available live streams. Typically there are four streams, English and Spanish for both the home team and the road team. You can select any of the available streams. In my case, the list of available games was working, but the app never found any live streams for any game. You can see what this looked like below. The first thing I did, was switch to another Android device. Both were running Android version 7 (one was 7.0, the other 7.1.1) and both had the exact same problem. The problem was limited, in that I could see the audio and video for the free game of the day. So, I got my ducks lined up in a row and decided to call MLB for help. Among the ducks was the fact that both devices were using the latest version of the MLB app, version 7.4.1 released July 25, 2018. I also dug up the email address I registered with (I have many email addresses) and the credit card I used to pay for my subscription. Paying customers can call MLB for help at 866-800-1275. They are open Sundays, Noon to 10pm ET and all other days from Noon to Midnight ET. Someone picked up the phone quickly, but then I got a grilling as if I was applying to work for the NSA. Baseball wanted to know my name, my mailing address, and my phone number. I had no idea which, if any, phone number I used when purchasing my subscription. They also wanted the last four digits of the credit card that paid for the subscription. Oh, and eventually, they asked for the email address that they use as a userid. It seemed, to me, that I was speaking to someone reading from a script. They never asked for either the version of the app or the version of Android. It also seemed that the person on the phone had no understanding of how the app worked. My attempt to describe the problem in detail was ignored. That must be later in the script. After my identity was validated, the first technical thing Baseball said to do was to "refresh" the app? What does that mean? Clear the cache? Clear all data? Uninstall and re-install? The person I spoke to could do nothing but repeat "refresh the app". She was clueless, so I gave up and hung up. No use talking to the wall. I was going to call back and gamble on speaking with someone else. But, since I knew the next step in the script, I figured I would un-install and re-install the app beforehand. That fixed the problem; on each Android device. As shown below, I can now chose among multiple live streams for a game. Good to know for the future, it would have saved me a ton of aggravation had I tried that first. My MLB subscription is just for audio. I have been tempted to sign up for video too which would let me watch games on TV through a ROKU box. But, with tech support like this, there is only so much money I care to risk with Baseball. P.S. 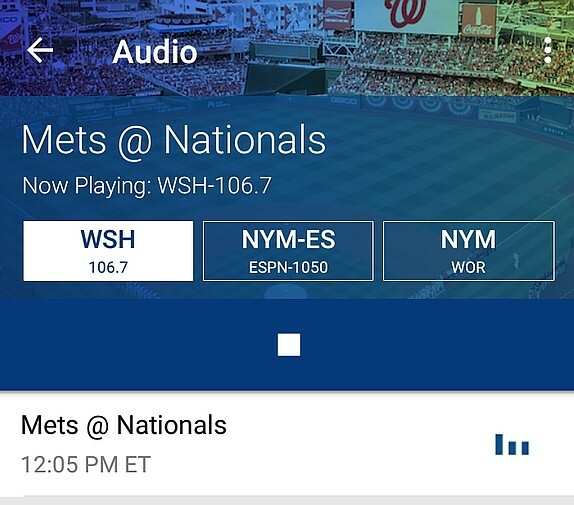 The next day, I tried the MLB app on an Android 4.4 system. This was not the latest version of the app (it was v7.2.1), but the problem with the audio streams was exactly the same. Clearing the cache did not fix it. Clearing all data, although it required me to sign-in to the app again, did not fix it. As before, un-installing the app and then re-installing it, fixed the audio problem. Way to go MLB. MLB has an online cheat sheet for Android troubleshooting that is, clearly, pathetic and ancient. There is no date on the thing, probably because that would bring shame. It has a section for the long-gone Amazon Fire phone along with instructions for Android version 4. Missing are instructions for Android versions 5, 6, 7 and 8. Even their business hours are wrong, as if they had not been updated in years. Update. August 1, 2018. Added screen shot of the app working normally.